Will Nintendo really no longer develop a cheap portable. An awful lot of Gameboy and DS owners were / are kids whose parents made that purchase as its was cheap and a sort of a my first gaming machine. Cant seeing them splashing out $300. Plus how ideal is a portable with only 3-4 hours battery life. That's because it's not YET replacing 3DS. 3DS is still going strong for Nintendo, and even trying to replace them now wouldn't be smart at the moment. 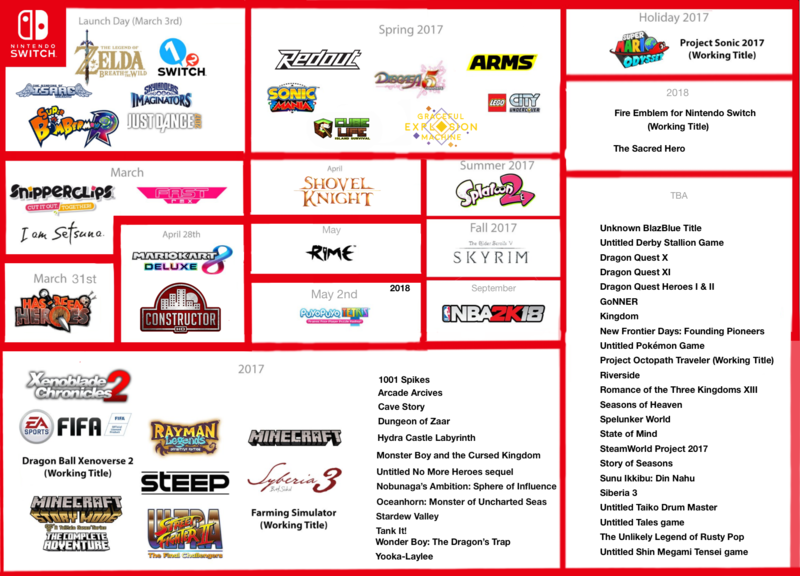 So 3DS has probably at least a year or two, and then when Switch Pro or the NEW Switch or whatever they'll call their next iteration of Switch is announced at least, then perhaps they'll consider letting 3DS go. Portability of the Switch is more a option to play more "standard games" on the go (for few hours), instead of games more specifically made for handheld play. That said, Switch marks the beginning of the end of 3DS. 3-4 hours isn't the battery life. @Haru17 That's probably a pretty safe expectation based on what Nintendo themselves have said. "Nintendo said the Switch’s battery life will vary on a game-by-game basis, ranging from two and a half hours to six and a half hours. The system’s 4,310 mAh battery will last for approximately three hours while playing Breath of the Wild, according to Nintendo"
Yeah, if thats their idea, again it seems like Nintendo is doing everything backwards again. They lost an opportunity in not adding 3DS support to the Switch. But if it isn't, I wonder what things will be coming out on 3DS and not The Switch, that warrants its further existence. @FF7Cloud that has nothing to do with its battery life off the charger though. it will, eventually. They basically have no competition on the handheld space so, there's no need to hurry. At some point the Switch will be $100, have pokemon, other mainstream titles and will be a success. It's replacing the Wii U, not the 3DS. Don't fully get the complaint about battery life. Even my parent's 2012 car has a USB port which means it can (slowly) charge your devices. Schools, workplaces, and literally everywhere have outlets. I'm a backpack type of guy where I carry my charger and laptop with me most places. When I know I'm gonna be working on my project from 8AM until god knows when at night, I bring a phone charger, laptop charger, Vita charger, etc. Not too shabby. @TokyoSlim Three hours is a safe expectation for The Legend of Zelda: Breath of the Wild because Nintendo stated as much in their press conference, unless we'd like to assume lower. We have precisely no information about other games without understanding the system's architecture and how they will be programmed for it other than the 2.5-6 hours Nintendo provided. The battery life thing is weird. It is on par with playing most intensive mobile games on iOS/Android and the 3DS, heck it is even on par with gaming on most laptops and there are plenty of charging options readily available. I can get it being an issue in situations like long haul flights but realistically how frequently is that going to impact most people? As for replacing the 3DS it will be a gradual transition. We have at least one year of 3DS games before Nintendo make up their minds on if the Switch is their sole console line that straddles home and portable play. I wouldn't bank on a new 3DS like dedicated portable unless the Switch completely crashes and burns. Which at the moment looks pretty unlikely due to the healthy amount of buzz the console is generating ahead of its launch. I really think that the Switch needs to be down around the $200 mark to start attracting people away from the 3DS. Maybe a 'portable mode only' model which is cheaper could start to do that, as has been speculated. The 3ds started at $250. And still costs $200 today for 6 year old tech. I don't see the Switch replacing the 3DS. Unless of course ALL 3DS devs jump ship onto the Switch. Which is unlikely, but possible.